The onscreen/offscreen couple and the first-time feature filmmaker on messy love, unrivaled collaboration, and The Other Half. 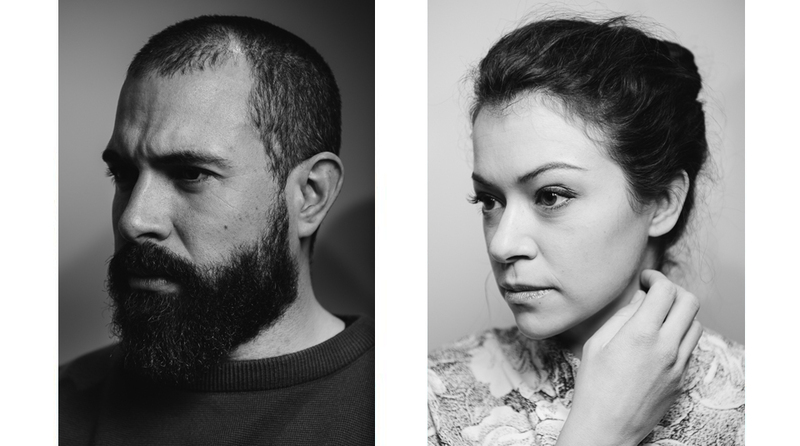 Tom Cullen and Tatiana Maslany in New York City. © 2017 Reto Sterchi. There’s an acceptance of the wholeness of a person, as opposed to a shiny veneer. We don’t run away after they reveal themselves to be more difficult than initially thought. In Joey Klein’s impressionistic romance The Other Half, two combustible lives collide to spark fiery passion that’s just as easily extinguished in a series of preludes and aftermaths, and persistent loss and newfound love. The Canadian film marks Klein’s first feature out as writer and director. 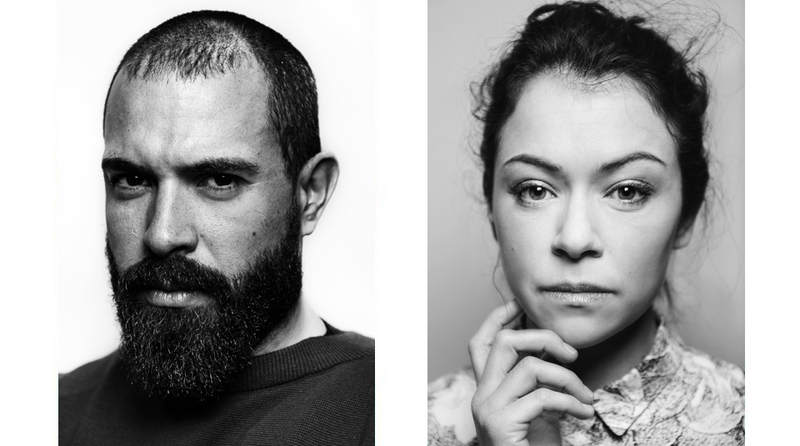 Tatiana Maslany plays Emily, a mercurial woman with severe bipolar disorder, and Tom Cullen is Nickie, a morose hothead stunted by depression following the unexplained disappearance of his younger brother years ago. Emily first meets Nickie as he’s unloading unchecked fury onto a pesky patron at his day job. She intervenes, all googly-eyed. As luck would have it, Emily’s in one of her brief windows of stability. They quickly lose themselves in each other’s arms and find solace in their shared dysfunction. Still, Nickie tries to conceal his chronic melancholy and barely-corked rage under layers of bravado and macho posturing, while Emily cycles between wild buoyancy and terrifying manic episodes. Together, they clumsily clear a path towards something profound. In allowing this ill-fated duo to simply exist in their slow spiral towards possible stability—rather than hurtling them into a certain tragedy—Klein is sensitive to the incremental changes that come with fortifying love and the self-destructive demons we sometimes fight in order to maintain it. The Other Half is a homegrown effort for Klein, modestly undertaken between close friends. It’s beautifully captured by DP Bobby Shore (Closet Monster, The Invitation), and skillfully performed by Cullen and Maslany whose real-life romance offscreen is unapologetically felt onscreen. The Other Half opens in select theaters on March 10. It’s been a long journey for The Other Half, if you consider that you, Joey, started developing ideas, I think, around ten years ago now. I know it has gone through quite an evolution since its first conception. Were there times when you thought it wouldn’t get made at all? Joey Klein: Yeah, I think you have to be dedicated. And delusional. [Laughs] Also, I was fortunate enough to meet people who elevated me and made me better than I was. Somebody just asked [Tom and Tatiana] whether I wrote these parts for them, and while it’s true that I started writing before I knew them and before we all became close to our cinematographer Bobby [Shore], they really informed my process. They all helped with elements of the story and made it stronger. Once we were together, it made it easier for me to find the form and develop what it ended up being. Things have gone chemically wrong for Nickie and Emily—Nickie with his PTSD and Emily with her bipolarity—yet they’re not entirely tragic characters. They find each other—“they don’t smell each other’s stink,” as you playfully put it in the past—and they push forward. Tom Cullen: Thank you for saying that because that’s something we really believe in. This is a hopeful film. It’s about two people suffering and people slow to learn that other people are trying to save them. What I like about Nickie and Emily is that they’re not trying to save each other. They’re there to understand one another, without judgement. I find that really beautiful and very real. These are unpredictable characters. For instance, Emily has a hysterical meltdown after going off her meds and Nickie will get into one of his scuffles on the account of his jealous rage. What did you find most compelling about your character on the page, Tatiana? Tatiana Maslany: What I enjoyed so much about Emily is that she’s much more complicated than women with mental illness that I’m used to seeing in film. It’s a part of who she is, but it’s not cutesy or romanticized. It’s something real that she has to deal with on a day-to-day basis, which makes it difficult for her to relate to others. She finds a kindred spirit in Nickie. She recognizes something in him that he recognizes in her. It’s unspoken and goes beyond their traumas. Like Tom was saying, there’s an acceptance of the wholeness of a person, as opposed to a shiny veneer. We don’t run away after they reveal themselves to be more difficult than initially thought. Emily and Nickie are brought together by their complexity and what they go on to reveal to one another. One of my favorite moments in the movie seems improvisatory: when Nickie and Emily take imaginary bullets. It’s very brief in the context of the whole film, but it leaves a strong impression. How much of what we see were found on set, as opposed to being written down? Tatiana: We were pretty true to the script throughout, but Joey definitely allowed for us to go off in a lot of scenes and sort of find something, like a moment of levity or a moment of connection. Nickie playing the ukulele with Emily sitting on the sofa and improvising a song—that’s just play and a part of it, you know? Joey was really open to that and generous in giving us that space. Tom: We only had sixteen days to shoot, so we had to be reasonably structured. Maybe if we had some more time we could’ve experimented more, but the script was really good so we stuck to it. Joey encouraged us to find little moments, little bits that came out organically within the structure. Sixteen days seems like a mad rush toward the finish line. But you guys did it. You got a lot. Could you tell me a little bit more as to what the collaboration looked like on set on any given day between the three of you, and also with your cinematographer Bobby Shore? Tom: Bobby is an extraordinary cinematographer. His work is brilliant and his work on this film is just fantastic. I think it looks beautiful. What Bobby offers is immense commitment and generosity to the story, as if he was a third character. He was with us all the time and, with his team, it felt intensely collaborative. This was the most collaborative experience I’ve ever had on a set. Everybody, from the set decorators to the costume designer to the makeup artist and the camera department, was invested in telling this story together as a conglomerate of people. I feel like that translates onto the screen, even though we didn’t have a huge amount of time and we had to jump in really deep. It was heavy, raw work. I don’t think Tat and I felt unsafe to do that at any point. We felt supported. I feel that the real reason we were able to go so deep has got a lot to do with Joey who leads with a very egalitarian, smooth hand when he’s directing. It was a real pleasure. That’s the beauty of doing these small movies: It doesn’t feel out of your control and everyone has space. Tatiana: It’s not just a machine. Tom: There was a time near the end of the film where Tat’s having a really big break. It was a night shoot, it was the last scene we were doing, and we were right by a train line—everything was against us. Joey and Bobby had set up the shot, but I felt like Tat and I needed to get deeper into it. So I just got onto my knees and started talking to her as Emily, “You’re going to be okay,” and started the scene. 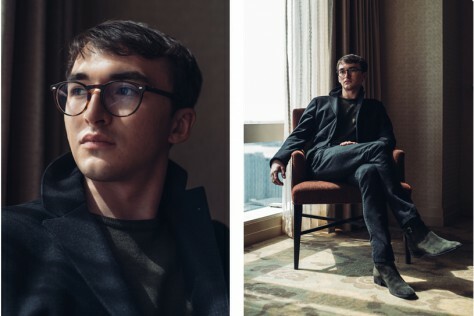 There was still ten minutes before we were going to shoot and I felt like we really needed to stay it because it wasn’t something you can just drop into. Joey sort of noticed what was going on and said to Bobby, “Can we just change it now?” At the drop of a hat, Bobby changed the shot completely and shot it in a totally different way. That’s what the collaboration was like on this. Tatiana: Even though it was night, the lighting set up a certain way, and everything was precious. Tom: And working against time. That kind of collaboration where it’s in service of the work is something really rare. You’re often having to compromise your instincts, or yourself, for so many different variables. On this, it felt like the work was driving us. We were in service to that alone. Joey, you’re also an actor. Directors often talk about how, if they do have that background, it’s easier to empathize with actors. They understand how scary it is to put yourself out there and know exactly what they’re asking of actors. Did that create a shorthand for you guys? Tatiana: Absolutely! We’ve all acted and we all know what it’s like to be directed. We understand that world, that relationship, and that dynamic. Joey talked so much over the years about the way he wanted to work and the kind of work he wanted make. This is Joey’s first feature film.